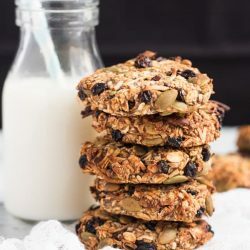 Never skip breakfast again with a batch of these Grab and Go Banana Breakfast Cookies in your freezer. Naturally sweetened, these are seriously good for you. Preheat the oven to 175C (155C fan forced). Line a baking tray with paper and set aside. In a small bowl, mash the banana until smooth. Set aside. Combine the remainder of the ingredients in a large bowl. Add the mashed banana to the dry ingredients. Mix well to ensure all of the dry ingredients are coated with the banana. Let the mixture stand for five minutes to absorb the moisture from the banana. Take a scant 1/4 cup of the mixture and press it together to form a solid round cookie. If the mixture does not hold together, wait a few minutes and try again. Place the cookie on the lined tray and pat gently until it is about 7cm wide and 1.5cm high. These cookies will not spread in the oven, so the shape on the tray is the shape of the finished cookie. Repeat with the remainder of the mixture. Bake for 15 - 20 minutes, or until the cookies are golden. Remove from the oven, then transfer to a rack to cool completely. Keep for up to two days in an airtight container, or freeze until required. As the sweetness in these cookies comes from the banana, make sure to use really ripe bananas. If you have a sweet tooth, you may like to add some additional sweetener to the mix.